Did you get a TRACK Rx brochure or Rx from your Doctor? If you picked up a TRACK Rx brochure at your doctor office and completed the activities, please register your adventure through this page. If you received an actual prescription (Rx) from your doctor or nurse to participate in outdoor activities in nature, or to hike a TRACK Trail, please fulfill your prescription through this page as well. If your prescription had a serial number on it, please enter it when you fill out the registration form. Your serial number will allow us to notify your doctor about your fulfillment of the Rx. When you register your TRACK Rx brochure or fulfill your “Rx” through the website, we will mail you a special TRACK Rx prize in the mail for completing your registration. Kids in Parks has created the TRACK Rx program to help kids and families learn how spending time in nature improves their overall health. We have done this by partnering with pediatricians and nurses to advertise the program through the installation of our TRACK Rx materials in doctor offices and community health care centers. 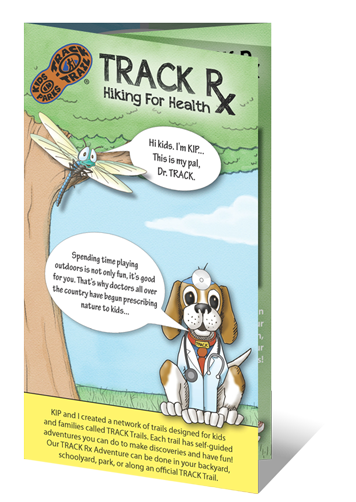 The program’s TRACK Rx materials include miniature trailhead signs that house our TRACK Rx brochure, and prescription pads (Rx pads) doctors can use to prescribe outdoor activity in nature and our network of TRACK Trails to their patients. Why does Kids in Parks have TRACK Rx Materials in Doctor Offices? There are numerous studies that link our overall health with spending time outdoors. When we play outside, our muscles grow stronger, our cardiovascular health is improved, our brains get smarter, and our self-esteem grows. Doctors and other health-care providers are beginning to see the side-effects that result from sedentary lifestyles, and understand the benefits children receive from being active outdoors. Kids in Parks is partnering with these doctors and health-care providers to get our program’s materials in the hands of their patients. Our partnering doctors are on the cutting edge of a national movement to prescribe outdoor activity to their patients called Park Rx, or Park Prescriptions. Want more Information of the Park Rx Movement?